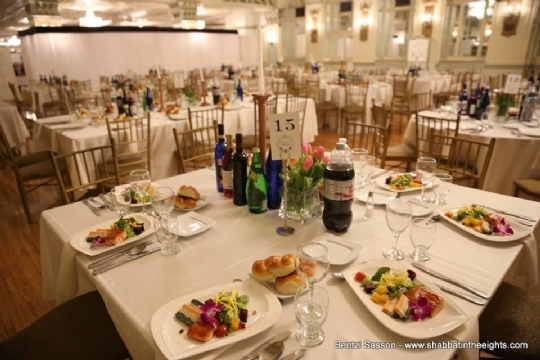 While there is no way to put into words how the life-changing JLI trip “Shabbat in the Heights” touched my soul, I will try to communicate my experience to you. I grew up in Southern California and the analogy that comes to my mind is the scene in the movie The Ten Commandments when Moses comes down from Mount Sinai for the first time. His face is visibly changed, his hair whiter, and a glow of awe and holiness shines from him. I feel the only thing that could’ve had a bigger impact on me, was if I also was to come down Mount Sinai myself and experience G‑d first hand as Moses did. While I may not have seen a burning bush, I was felt heavily pulled by G‑d the entire time in Crown Heights. While in Crown Heights, my soul was and is still filled with unexplainable emotion, that I will spend my life trying to understand and take action on to ensure this feeling never leaves me. As I mentioned in the first sentence, there is no way to explain my emotions to you. I arrived in Crown Heights via subway and walked only a couple blocks to the house that graciously volunteered to let me sleep there (without ever having seen or talked to me until I arrived). When I arrived at the house, I was warmly greeted by a Merilla, who was 69 years old. She opened her home to me immediately and gave me the security code to her front door so I could come and go. Her trust in me, simply because of my religion, touched my heart. What probably touched me the most was being in a city filled with Jewish children walking and playing freely on the streets - boys in kippas, girls in dresses. I thought of how my son frowns when I ask him to where his kippa, while these children have worn them since birth. Seeing so many Jews in one place living without fear of any condemnation touched my soul deeply. I wanted to hug each Jew I saw. They must have thought me strange as I said hello to every single person I passed. I was so happy to be among “my people”. The first JLI session began with a tour of Lubavitch World Headquarters (770 building). There were easily over 200 of us on the trip from all across the nation and even Mexico, Canada, and Argentina. We were led to the Rebbe’s study room and office where we were able to say a prayer. The Rebbe’s office is kept much like he was still there, and I could certainly feel my prayers received in a way I never have before. This was extra special for me as I was determined to pray hard for my sister, who is being painfully destroyed by Cancer. We then had a wonderful speech on the meaning of Shabbat, and what it means to “rest”. The explanations given touched me as it wasn’t about resting from work, but more about making time to get in touch with my soul and my relationship with G‑d and myself. I also appreciated that this lecture was given by a woman, removing any thoughts I had that Chabad does not let women speak. Mrs. Shimona Tzukernik is a respected Chabad teacher and writer and she spoke with a wisdom and spirit as wonderful as any Rabbi. I appreciated that Chabad had no prejudice, as I might have thought. Her fantastic explanation of the meaning of Shabbat was the perfect beginning to the Shabbat weekend. The Friday night service was so inspiring. Again, I could feel my prayers being heard deeper t han ever. It wasn’t so much the big congregation that touched me, but the spirit of the service. The wonderful singing that I love so much – some of the songs I hadn’t heard since I was a child, that I am now still singing in my head today. The dancing around the chairs while singing joyously, with our hearts fully engaged. After service we had what was to be the beginning of a weekend of NEVER-ENDING AMAZING food. After our Friday night meal, we were treated to a speech by Rabbi Manis Friedman, who spoke to us about the future of Judaism. The JLI provided speakers that were top notch and extremely qualified. Each speaker touched my heart greatly. All the speakers shared their personal stories and experiences with the Rebbe, which was wonderful to hear from people who had firsthand conversations with the Rebbe. Saturday morning’s service was again fantastic as they read from a Torah that was saved from the holocaust by a boy rushing into a room of burning Torah’s. It was amazing that JLI was able to acquire this Torah for this special weekend. JLI seemed to have any key to any door in Crown Heights they wanted. On Sunday we were treated to a tour of the Rebbes home, an honor not many get as the home is only opened once or twice a year. 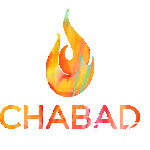 Saturday afternoon, we heard a speech by Mrs. Shimona Tzukernik and Chabad Rabbi of Pasadena who spoke about Shabbat and being on the “inside”. Mrs Tsukernik has developed something called “The Method”. She spoke of how we each live within our cube, how everything in life has 6 sides, a top, bottom, left, right, back, front. She talked about how we are each at the center of our own cube and how knowing that helps us deal with relationships by allowing each person to have control of their own cube. Again, there was a direct correlation with her speech and the Torah portion, which spoke of loving others as I love myself. The talk made me think about how I try to control others. We also discussed how you have to love yourself in order to love others. I am only at the center of my own cube, and that is where my life-changes will start – one step at a time. After Saturday service, we were treated to lunch at our Rabbi’s sister’s home. The home was so beautiful and the never-ending food was better than any 5 star restaurant. But more importantly, the lunch was filled with great conversation and singing. I imagined what it must be like to have every meal filled with such spirit and love. We were so warmly welcomed, I felt like I was with family and at that moment I did not want to ever leave that home or the city of Crown Heights. As my Rabbi says, I must make my home Israel. After lunch on Saturday, I had a personal miracle. There was a speaker that seemed to be sent straight from G‑d to me. As I mentioned, I needed to pray for my sister’s battle against cancer. About a year ago I bought my sister a book (Radical Remission) about 10 people that beat cancer after doctors had diagnosed them terminal. It turned out that one of the presenters was a lady who was one of those 10 people. A lady (Saranne Rothberg) that beat stage IV cancer had come to speak about the power of laughter and opening up your body and mind to let G‑d’s miracles rain down. I thought there was no way this could be a coincidence. Her speech was incredible and humorous too. After she spoke, I approached her and told her of my sister’s troubles. She volunteered to call my sister (and did so immediately after Shabbat). I knew this was the beginning of my realization that miracles were happening all around me. I made an extra effort to not use my phone during Shabbat, but I could not contain my astonishment and had to find a hiding place in the building (so that I would not disrupt the spirit of Shabbat to those around me) to call my sister right away and cried very hard to her that hope and positive change was happenning. Praise G‑d! The Torah portion of the week also happened to be extremely special as it talked about being Holy. Apparently, it was one of the most important Torah portions (thought they are all important). The torah portion was explained beautifully, not just at the Shabbat service, but throughout the weekend. Each speaker seemed to expound on the Torah portion a bit more, providing more and more insight and wisdom. After Saranne spoke, there was a funny “crossfire” session, where Rabbi’s provided quick answers to hard questions about Judaism. It was entertaining and educational and made learning fun. 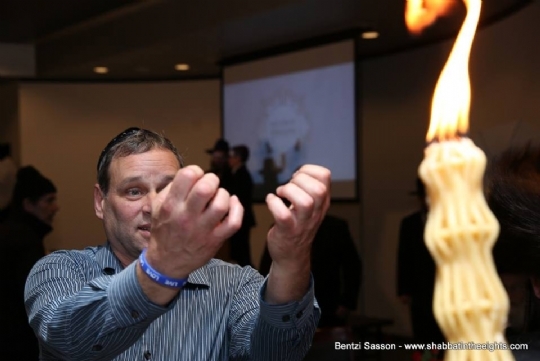 It showed me that learning about the Torah did not have to be a mundane chore. I headed back to the house I was staying briefly before going to my first Farbregen. While back at the house, I met the man of the house, who asked me how my trip was going. I could not contain my emotion as I told him the whole weekend was a miracle for me. He asked me what Judaism was to me. I told him it was the core of my soul. As I answered him, I realized that Judaism is so important to me in a way that is somewhat unexplainable. Why is my heart, mind, and soul being so affected by this trip I wondered. I can only tell you that I feel like Moses did coming down from that mountain. Overcome with emotion, my soul felt like it was being re-fueled. I showed up a little late to the Farbregen, but was easily able to still connect to the conversation about Judaism and Torah. There was talk about how we can climb the ladder of Chabad one step at a time. I was feeling overwhelmed by all the action that I was feeling I should take to change my life and atone for my past sins. But the Rabbi’s helped me by explaining that we can take action a step at a time. After the Farbregen, I headed to yet another scheduled program at the Children’s Jewish Museum in Crown Heights. It was about 10pm and I had to walk by 770 again. As I walked by I had to take pictures of the crowd, which was poured into the streets. Again children praying happily and full of spirit in the street in front of 770. I was amazed and again filled with Jewish pride to see children up at 10pm, still praying, playing, and waving flags that read “Messiah”. I still wonder how a Rebbe can touch so many and leave such an impact. Rabbi’s continually told us how the Rebbe worked 20 hours a day. He was not a young man, and yet he kept going and going. When I am tired now, I think that if the Rebbe can find the strength to support a nation 24 hours a day, I can certainly find strength to do the few things on my plate daily. I now think of the Rebbe, and push myself just a little harder. He gives me strength. At the children’s museum we were treated to a speech by a 13 year old blind girl, who touched everyone in the room. She told how G‑d and Chabad has helped her overcome her vision impairment by providing her with brail schooling. She told how she ate kosher, while in a school for the blind, where she was the only Jewish girl. If she can keep kosher, who can’t I wondered. As one of the previous Rabbi speakers had said, why should I keep kosher? Because non-jews don’t. I feel more blessed to be a Jew than ever. As I opened my refrigerator to cook dinner upon my return home, I cried. I didn’t really know why, except that I wished my house was already filled with kosher food. Another action I will take one step at a time. On the airplane home, I held on to my kippa and hat tightly, now wanting to let go of the feeling I had inside. On Sunday our last program item was to visit the gravesite of the Rebbe. I knew this would be my best chance for G‑d to again hear my prayer at an extremely holy site. My Chabad Rabbi educated us prior to going to the Rebbe’s Ohel about not only customs at the Ohel, but more importantly the importance of a grave-site, and understanding our emotions we feel at the site. I was so emotional, that this speech helped me focus on understanding my emotions, instead of just feeling emotional. I wrote my note of prayer for my sister and family and got my pebble to place on his headstone. As I entered the Rebbe’s Ohel, my tears again began to fill. I grabbed one of the many prayer books as I entered. I didn’t know what kind of book it was, but opened a page and began reading. Amazingly, the pages immediately spoke my words for me. How could this be I wondered. How could these pages know what I was feeling? I did not want to leave the Rebbe’s grave-site. If I did not have a taxi to catch to the airport, I would have stayed all day there. I felt so close to G‑d and my soul again felt at home. I did not want to leave. To those thinking of going to Crown Heights, I would say do not hesitate. I know I can go back anytime, no hotel necessary, as there are a city of Jews that would welcome me in their home. My promise to my soul now, is to keep it fueled with this feeling of joy, spritualness, and a longing for a closer relationship with myself and G‑d. JLI provided us with a wonderful easy to read daily Torah reading book. I woke up Monday morning thanking G‑d for everything around me. I plan to wake up each morning that way. It will be hard to remember that my past is not necessarily who I am, but maybe who I was or a place I’ve been. I hope that I do not forget this feeling I have today. I’m not yet feeling comfortable wearing my kippa to work or in public, where I would stick out, but one day I will be – 1 step at a time. On the other hand, since I’ve been home, I haven’t let my kippa out of my sight (I now keep in in my pocket, which is a start). I plan to work on my inside first. The clothing will come, but I want to make sure I pray daily, thanking G‑d for his constant guidance and direction. I believe my wife and children can easily see that glow that I have around me from being a Crown Heights and feeling G‑d – in a way that certainly feels like I’ve been to that mountain. I may not be in Israel or Crown Heights, but I can make my home a place where I still get that feeling I had when I was in Crown Heights. It won’t happen overnight, but I now vow to lead my family toward that joyous feeling of Judaism and Shabbat. I wish I could thank JLI in a way they would understand how deeply they touched me – and my sister. I met a few new people, but I was especially happy to have a few familiar faces around me from my Chabad, especially my Rabbi. Rabbi Paltiel is a beautiful example of Crown Heights, right in my backyard. He is an extension of the Rebbe, and like the Rebbe, treats his entire congregation like his family.